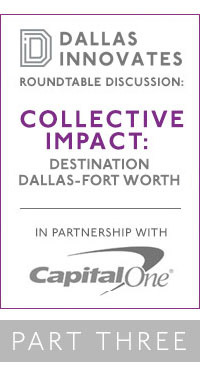 The Dallas Innovates “Collective Impact” roundtable brings together a variety of perspectives — from nonprofits to corporations to startups — to discuss the state of social innovation in the North Texas region and beyond. Our expert panel explores the concept of collective impact in social innovation, talks about the attraction of Dallas as a hub for impact, and asks how we can do more, better. The panel, moderated by Salah Boukadoum, ends with predictions of where things are heading. Boukadoum, as both a social entrepreneur and founder, is uniquely positioned to lead the discussion, as well as participate. You were introduced to our panel and given a scope for their different perspectives in Part One. Then, our experts discussed how Dallas-Fort Worth may be a unique breeding ground for social good, what attracts talent for the sector, and common challenges for the region, in Part Two. In our last installment, you’ll read about some of the trends impacting social good, the systemic issues that still need to be addressed, and some areas ripe for innovation. The discussion closes with a look into the future.